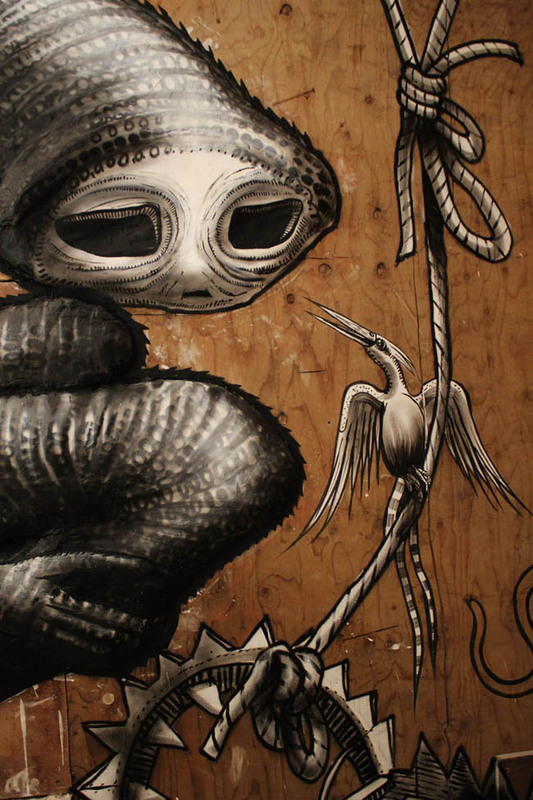 On the 1st of February Phlegm will launch a major solo exhibition in London at Howard Griffin Gallery. 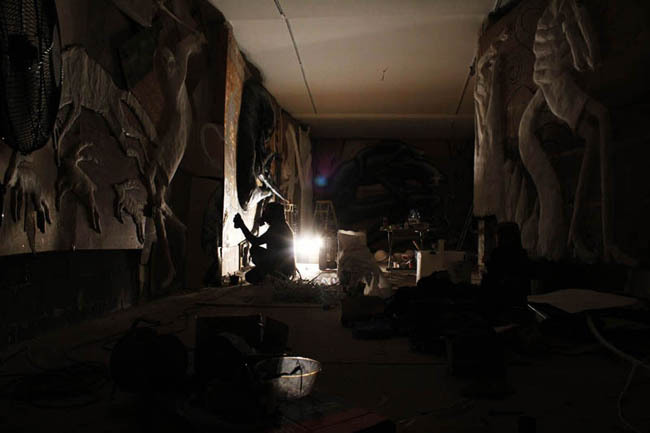 It promises to be a very special event given that Phlegm, who has risen to prominence as one of the greatest muralists of our times, has been working on producing it for the past six weeks. 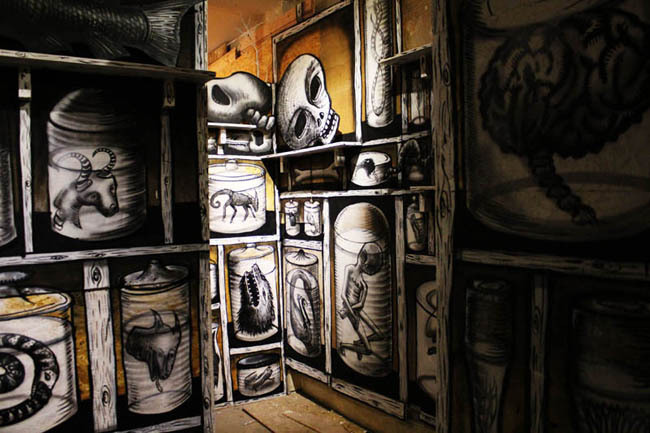 The show itself will comprise a large scale, museum standard installation throughout the entire space of Phlegm’s surveying a range of Phlegm’s work. The installaion is being kept entirely under wraps save for the two preview shots above and below. 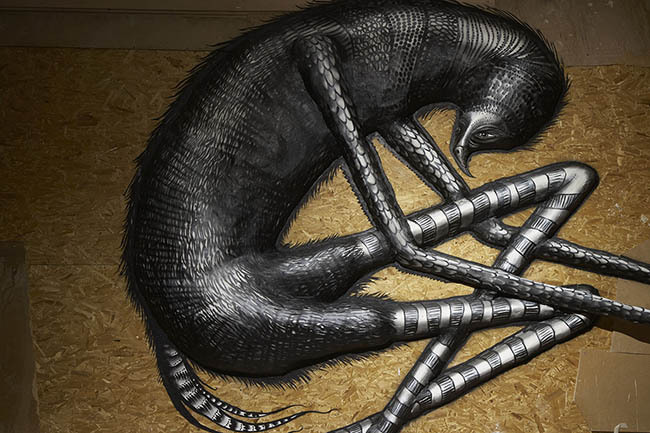 The concept behind the show is Phlegm’s take on a medieval Bestiary and is set out below, as enunciated on the Howard Griffin Gallery website. “A bestiary was an illustrated compendium of animals, half real and half imagined, setting out the natural history of each beast within and its moral significance. A bestiary was not a scientific text and while some beasts and descriptions were quite accurate, others were completely fanciful. Such bestiarys belonged to the ancient world and were popularised during the Middle Ages as didactic tools. Phlegm is a Sheffield based muralist and artist who first developed his fantastical illustrations in self-published comics. 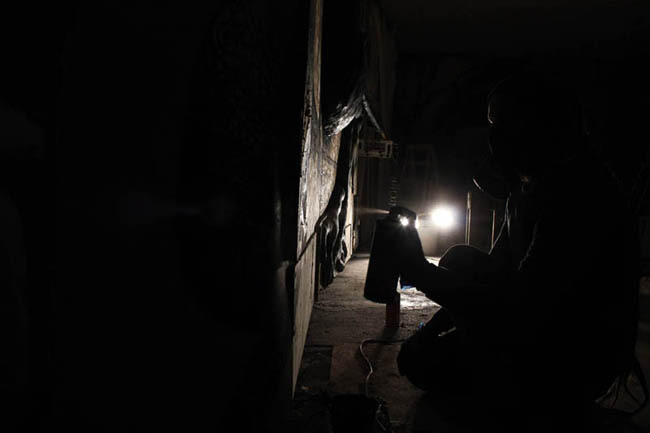 His work now extends to the urban landscape, and can mostly be seen in run-down and disused spaces. Phlegm creates surreal illustrations to an untold story, weaving a visual narrative that explores the unreal through creatures from his imagination. His storybook-like imagery is half childlike, half menacing, set in built up cityscapes with castles, turrets and winding stairways. At other times the city itself is the setting for his long limbed half-human, half-woodland creatures. In this dream world a viewer comes across impossible flying machines and complex networks of levers, pulleys and cogs, set beside telescopes, magnifying glasses and zephyrs. Working solely in monochrome, his fine technique and intricate detail can be seen as a curiosity cabinet of the mind. Each drawing forms part of a grand narrative that extends worldwide, in countries including Norway, Canada, Switzerland, Sri Lanka, USA, Belgium, Poland, Italy, Slovakia and Spain. A big compliment for your work of art! Whenever I am in London I visit Shoreditch in search of new Phlegm-street-art, it’s like a treasure-hunt :). 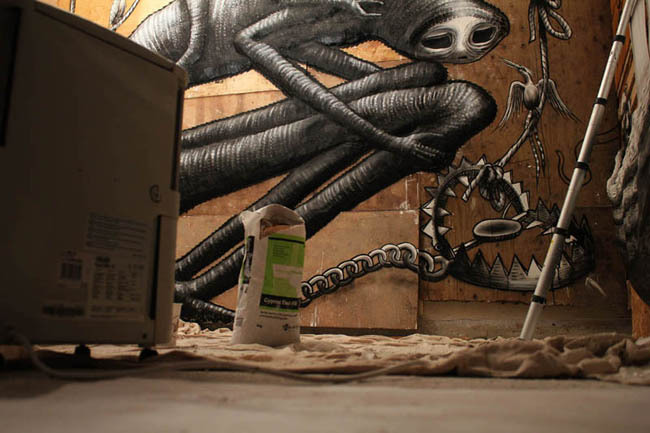 I am really frustrated that I will miss Phlegm “The Bestiary” exhibition. I am very interested in what you do and the things you make. Please put me on your mailing-list. Thank you. Much success with the exhibition! Vraiment du très jolie boulot, il n’y a rien à redire. Bonne continuation ! brilliant work! !always new and surprising! big influence on the kids that take my street art classes!